What is the best place to scuba dive or to get my diving permit? Which islands in Malaysia are best to take a scuba diving course? Islands surrounding Malaysia are renowned by divers all over the world as one of the best diving spots on the globe. Below the surface of many tropical islands you can experience the wonderful underwater world in all its glory. 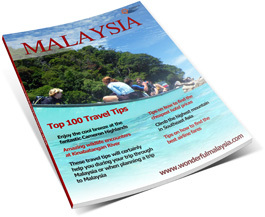 Great numbers of travelers visit Malaysia with the sole purpose of scuba diving. The best places to dive are the islands in the eastern part of Peninsular Malaysia and the islands in the eastern part of the Borneo province Sabah. Diving on islands in the western part of the peninsula is less popular, due to turbid marine water conditions which has a negative impact on underwater visibility. The only place to dive in this area is at Pulau Payar, a small uninhabited island that lies between Langkawi and Penang. This is however a somewhat spoiled tourist attraction, so it’s better to head out to other parts of Malaysia, where diving conditions are perfect. Package deals are very popular in Malaysia. Many resorts have some sort of partnership with diving schools, so you can arrange accommodation and a scuba diving course at one location. Most packages roughly consists of the same components, 4 or 5 nights stay at the resort, the diving course incl. books and equipment, the boat ride from the mainland to the island and back, free meals and drinks and in some cases a couple of extra fun dives. The best place to get your scuba license is at one of the islands on the eastern side of the peninsula. Package deals are cheapest at Perhentian and Tioman; here you can get your official PADI for approximately 1000 Ringgit Malaysia (€220 or around $240). All diving schools are certified, some have more ‘stars’ than others. Prices are roughly the same at most of the diving schools. Should you want to get your dive master (or rescue diver or any other advanced course) license, you should probably contact some of the diving schools up front. Price does however differ great from regular prices in most European countries. For example a diving course in the UK or the Netherlands can be twice or even three times more expensive. A typical diving course takes you four days at the least, or 3 days with only 2 students per instructor. Don’t bother to try and do it in less days, you have enough to learn so a four day course is the absolute minimum amount of days. We did a 5-day course at Perhentian. We paid €190 for the standard PADI course, this was incl. of books and equipment. Other islands in Malaysia are perhaps less interesting to go to for a diving course, since prices are usually a bit higher there (i.e. Redang) A new approach by many dive schools is to offer a paperless alternative to be more environment friendly, is to let you choose to do an online course on the PADI website. Recommended diving schools on Pulau Perhentian are: Flora Bay, Coral Sky Divers, Watercolours, Spice Divers, Quiver and Pro Divers World. I only have (great) experience with Watercolours, but read and heard from fellow-divers that all other diving schools mentioned above a pretty good too. Scam Alert: We have seen several cases that students sign up for a PADI course in Perhentian, but upon receiving their license it’s a SSI license. Even though SSI and PADI are comparible licenses, SSI is not PADI and this scam allows dive schools to maximize their profit. Our advise is to check the study material (has to be PADI branded), the license you get, and that you demand for a PADI license even when you are being told that SSI and PADI are the same, which is not true. Diving in this part of Malaysia depends greatly on weather conditions. Especially during monsoon period diving is not an option. Resorts close during this period, since the weather can be extreme at times. It’s even impossible to visit the islands, since ferries are out of order for tourists. The monsoon period starts roughly in the beginning of November, and ends roughly around February. I use the word roughly, because some years the monsoon is very mild, starts later and ends earlier. Some years it starts around October, and ends somewhere in March. As mentioned before; scuba diving is not that great at islands like Langkawi, Penang or Pangkor on the western side of peninsula Malaysia. The best place to dive is at the tourist attraction Pulau Payar, a small island between Langkawi and Penang. 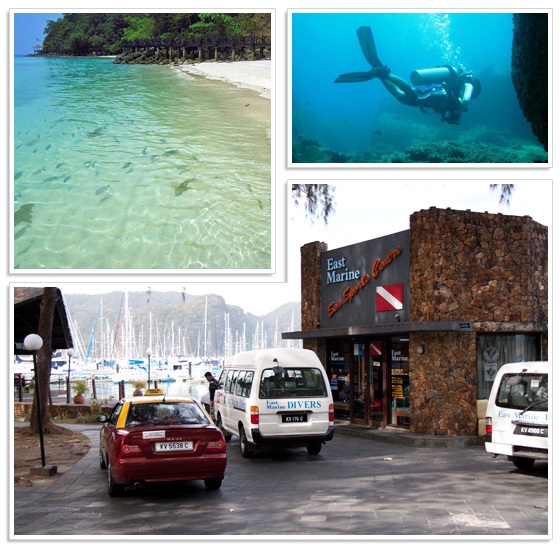 Diving here is pretty expensive, compared to other diving spots in Malaysia. Besides, coral isn’t that great anymore, though due to massive amounts of zooplankton there is an abundance of fish to spot underwater. Right next to Pulau Payar lies Pulau Kaca; here you can dive to a number of shipwrecks. Though we haven’t been there ourself, we read pretty good stories about diving at Kaca. Don’t have a scuba diving permit? You can also head out to Pulau Payar for a snorkeling trip, it’s a fun day out and you’ll see many beautiful fishes on the shallow shores of the small island. You want to get a diving permit and it’s impossible to travel to islands like Perhentian or Redang? Get your PADI at Langkawi, at the dive center you’ll learn the basics and theoretical experience. The final dives will be done at Pulau Payar. It is a bit more expensive, but still cheaper than in most other parts of the world. Close to Pangkor Island you can find Pulau Sembilan. Until recently this island had one fairly popular diving school, Sembilan Divers. Unfortunately this diving school went out of business, so for now it is not possible to dive in marine waters around Sembilan. When you plan a diving trip to islands surrounding Sabah, you’ll soon end up at the some of the best diving spots in the world; Pulau Sipadan and Pulau Mabul. Both islands have the best diving conditions you can imagine, although it’s better to be an advanced diver due to currents and depths. At these islands it is also possible to do a diving course; prices are affordable, though accommodation can be pretty expensive. There are some resorts (there are not that many resorts) where you get a package for roughly $1000 for a couple of nights. Compared to accommodation on for example Pulau Perhentian these prices are pretty high. Nonetheless, the price is worth every penny, since you are visiting one of the best kept secrets of Malaysia. Accommodation is very exclusive, almost impossible to compare with the resorts at Pulau Perhentian. If you are a true scuba diver, this is absolutely a must-visit! Other famous diving spots at the islands surrounding Sabah are Kapalai, Labuan, Langkayan and Layang-Layang. All these islands have the same in common; great dives, great visibility, huge walls, various types of species and of course a great tropical experience on the islands itself. Unlike islands at the eastern part of the peninsula the monsoon period is not that extreme. Every now and then diving conditions can be poor due to bad weather down from the Philippines. Also don’t forget the Tunku Abdul Rahman Park just in front of Kota Kinabalu. Many divers think because it’s so close to the city the diving isn’t worthwhile, but that’s not true. We have turtles, mantas as several types of school fish – even blacktrip reef sharks in the park. You can also qualify as a diver from brilliant island settings, so it’s a great place to start and stay diving. Still want to visit that place. Are all dive schools located on the shores at KK or also at the islands? What is the typical price for one dive, and what would a refreshment dive cost? Is it also easy to just join a dive boat on a dive and go snorkeling yourself (in case you travel with non-divers that still would like to join on a trip)? All extra information is welcome :). 2) What do you mean with water sports (diving/snorkeling or jetskiing/parasailing)? 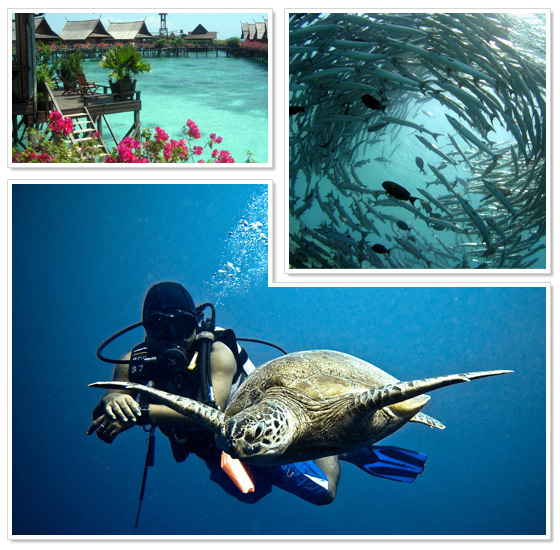 If you are into diving and snorkeling you would probably want to visit Perhentian, Redang or Tioman. Read more in the article above. I went to Mabul earlier last year, I think the diving in these areas have been effected by tourism . The local populous is quite close to the resorts there and a lot of rubbish washes up on the beaches, at the more classy resorts they pay some of the locals to come clean it away every day. Depending on the weather in the Philippines greatly changes the visibility conditions so you need to make sure you go at the right time. Also you can no longer stay on Sipadan island overnight. Never been to Malaysia but thinking of going there. I am fond of water sports especially snuba diving and snorkeling. So I would to like to try these sports. Oh wow It is so adventurous to watch tortoise and big fishes under water. I think it would be full of fear. I never had scuba diving but it’s my dream to do. Diving in the sea of Malaysia is like dream come true. You just motivated me and i am definitely going to do this whenever i get opportunity to travel Malaysia. Thanks for sharing.